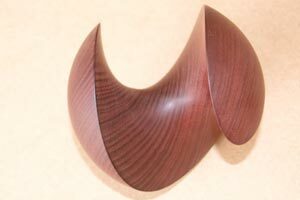 Wood 130mm diameter Sphelix in thitsi. Woah!! so much has happened since September, down with the banks, up with Obama and the recession biting in. The new size zero seems to be zero tolerance combined with zero accountability. Don’t you just love a bankers apology. When I was taking the Recession table back to its owners in the New Forest in early December, it took a dive in the back of the van coming clean off its trolley. Amazingly it only cracked a leg and along the undertop for an inch. It could have broken into a 100 pieces of firewood, its so delicate and quivery. There is so much emotion in this table and somehow it felt as if it wanted to be scarred by this recent recession as well as the 1990 one. Crazy and weird but that’s how it felt. Many many thanks to the wonderful clients who took the crash far better than I did. 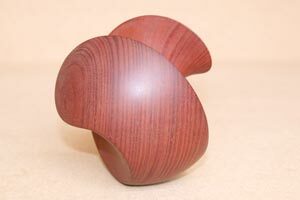 At last I have achieved making a wooden sphelix. They are so touchy feely. Work is ok at the mo with the Sphelix, sculpture side going well, I've been shortlisted for The Summer Exhibition at The Royal Academy and am down to the last 2 artists for a major commission for NCL’s new boat involving an aqua park on the sun deck. We are busy making a fab set of 8 chairs in oak and veneered aluminium but sadly the bespoke shelving systems we do for the Alcove company are really suffering. Sales are falling off dramatically. Still its not new ground and we are finding new cheese.